At Einstein Graphic Services, we know our products inside and out, literally. 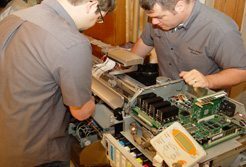 Our staff is trained on and authorized to service all of the products we sell. Beyond equipment sales, we offer integrated sales and full technical support of your hardware, software, firmware, media profiling and color matching. We are committed to making all of your products work together, promising your finished product is only the best. Customers who purchase their equipment from Einstein Graphic Services are given priority over other requests and can expect exemplary service. Unique Services can be found under our Exclusives Category.